it’s spring, the weather is just warm enough and the garden is bursting with lettuce and greens. for tonights dinner, i chose to make a salad using the different lettuces and spinach from my garden. the best part of the dinner, the grissini, or bread sticks if you prefer, to go with the salad. when i checked out the challenge for this month’s bread baking day, i was thrilled to see that it was simply to bake a pizza or an italian bread. so simple that it took me over a week to decide! the challenge for april is being hosted by manuela of cravo e canela and there is still time to submit a bread if you want to participate. when i would like to bake authentic italian style breads, there are only a couple of books i reach for. while trying to find some inspiration, i pulled my copy of the modern baker by nick malgieri off the shelf and opened it to a random page. it just so happens that the recipe i turned to was for grissini. 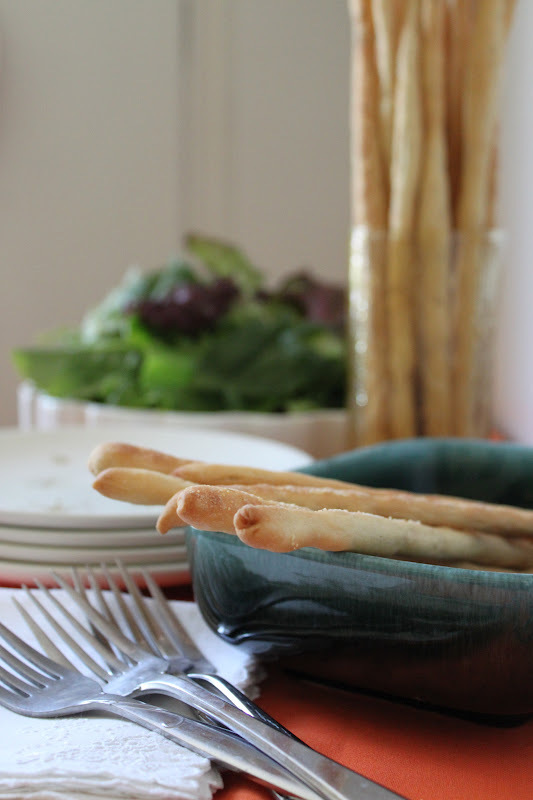 not just grissini but the easiest and most fool proof recipe for grissini i have ever tried. the dough is mixed up in less than 5 minutes by using a food processor. after letting it rise for an hour, the dough is deflated and allowed to rise again for as little as an hour or as long as 24 hours. 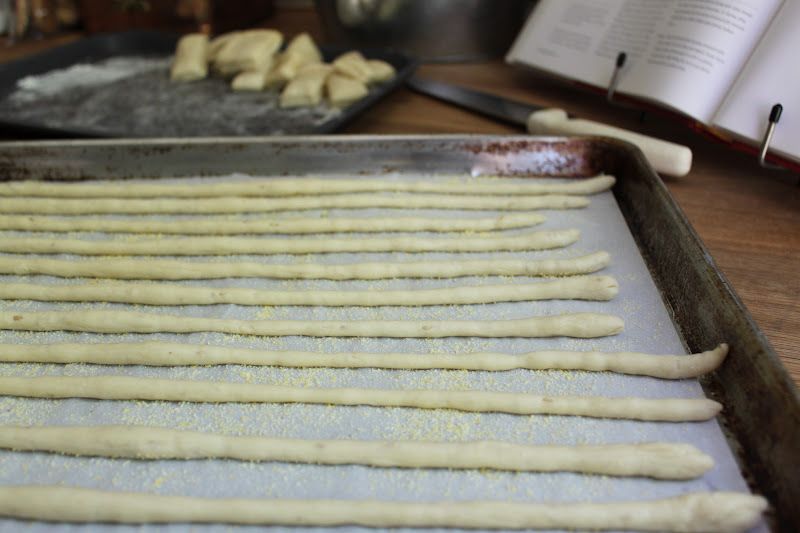 after sitting in the fridge for about 18 hours, i took it out and began the process of shaping the grissini. 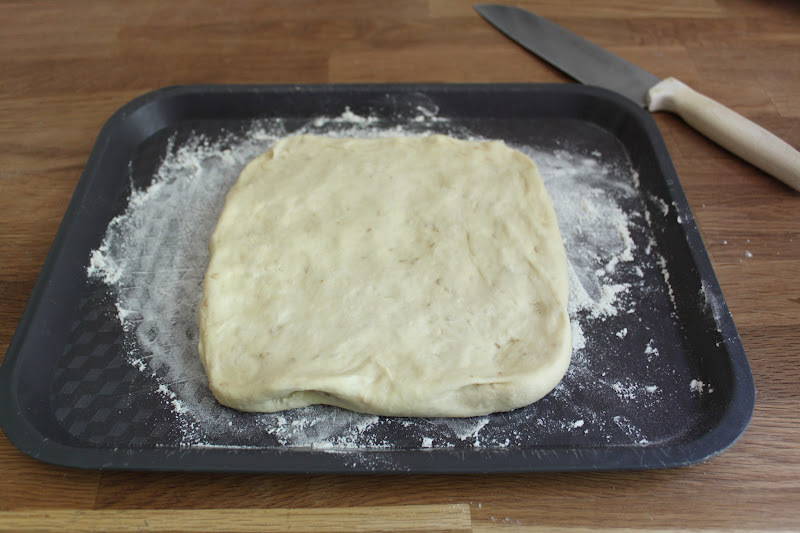 first the dough is deflated and shaped into a square on a floured surface. the sticks are shaped by rolling them with your palms as if you were making play-dough snakes. so easy, too easy really, and fast. with a recipe like this, you have no excuse not to make a batch. place the flour, salt, oil and sesame seeds in the bowl of a food processor. pulse it to combine and distribute the oil evenly. whisk the yeast into the warm water and add to the flour mix. pulse it 2 to 3 times. add the cold water and pulse the dough until it forms a ball. continue pulsing for 10 seconds. remove the dough and place it in an oiled bowl and cover it with plastic. allow it to rise until doubled, about 1 hour. scrape the dough out of the bowl on to a floured surface and fold it over on itself a few times to deflate it. once again, place it in an oiled bowl, cover it with plastic and place it in the fridge to rise for as little as 1 hour or as long as 24.
preheat the oven to 325. line two baking sheets with paper and dust with cornmeal. 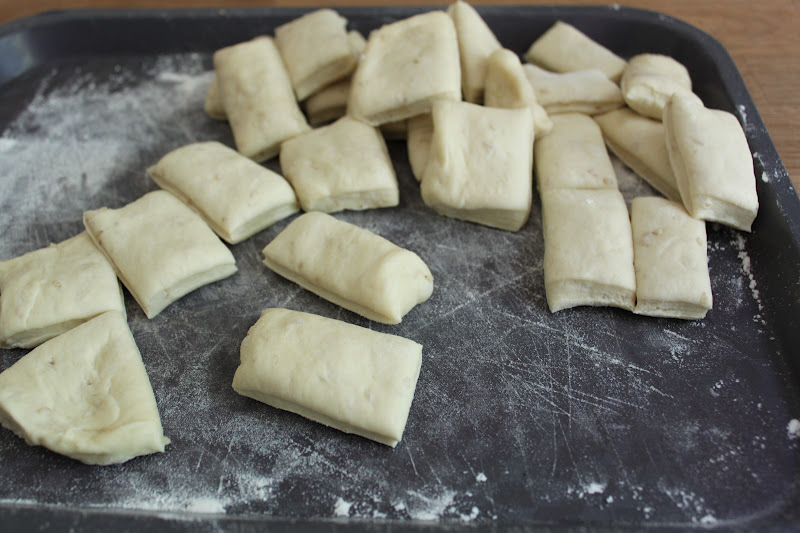 place the dough on a lightly floured surface and flatten it into a square with an even thickness. use a knife to cut the dough into quarters. take each of the quarters and cut it into 6 pieces by first cutting it in half and then by cutting each half into thirds. you should have 24 pieces in all. place one piece of the dough on the table and using your palms, roll the dough back and forth to make a rope. keep rolling it and using gentle pressure to make each one as long as the baking pan-about 15″ in length. carefully lift and place the stick on the pan. place the two pans in the oven and bake(no rising needed) for 10-12 minutes. rotate the pans and continue baking the sticks until they are golden brown and crispy, about 10-15 minutes. this took a little longer in my oven so keep a close eye on them to ensure that they are not over baked. this is a simple recipe that proves things do not need to be complicated to be tasty! here’s to you nick for a recipe well done!!! be sure to try baking a bread or a pizza and joining us. thanks to manuela for giving me an afternoon filled with yeasty goodness. Love your grissini. I just bake ones for my self today and posted for BBD.